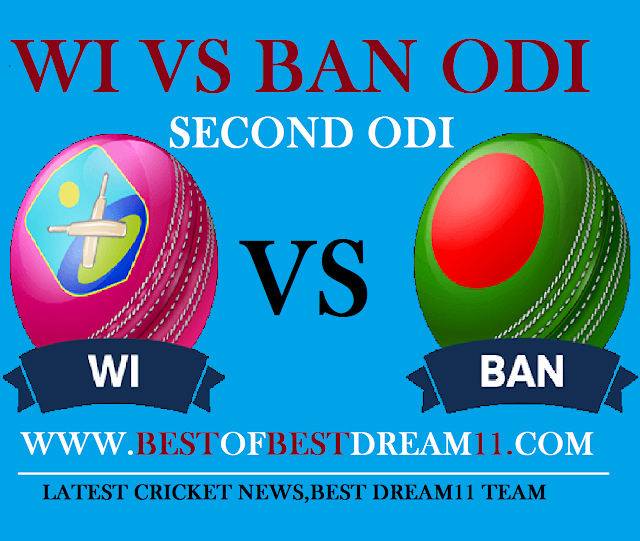 Here is best "WEST INDIES VS BANGLADESH" ,2ODI Match,Bangladesh tour of WestIndies, DREAM11 Predictions for the Fantasy user ,who venue are looking to make a strong team for maximum win. We are providing latest news, match update, information about the match .The team is picked by using various factors on the basis of performance, ground stats and latest form. "In the three-match ODI series, Bangladesh won the first match and took a 1-0 lead in the series.They won the second match and would like to make their series. After losing the Test-series, Bangladesh have made a great come back and they have left West-Indies behind in all the fields,whether it is batting or bowling department. On the other side, the West Indies have a long list of the world's most dangerous batsmen(like Chris Gayle,Andre Russel,Evin Lewis), but they all never get together well and do not perform well. After losing the first match(BAN won by 48 run), West-Indies team will try hard to come back. The first ODI of the series having been played on this same ground,it could be said that there is something in it for the bowlers.There was swing in the beginning and as the game progressed,the pitch become slower.Spinners will be less impactful than usual. 1-For Bangladesh,In the first match, Tamim Iqbal (130 runs) and Shakib Al Hasan(97 runs) were brilliant, both of them got a good score by playing responsible inning . 2-Mushfiqur Rahim (wk) came in the lower order and scored a brilliant 30runs(11balls) which helped Bangladesh score 279 runs. 3- M Mortaza bowled brilliantly,taking 4 wickets of west-indies ,due to which West-indies teams faltere. 4-for West-indies, Chris Gayle(40runs) and Shimron Hetmyer(52runs) played good innings but all other batsman have dis pointed. 5-Devendra Bishoo made a wonderful 29* runs and took 2 wicket also. 1-West-indies would want to strengthen their bowling so Keemo Paul in for Alzarri Joseph. 2-Bangladesh wouldn't want to change a winning combination. But if he makes changes, Lition Das can be brought to oppener in place of Anamul Haque.